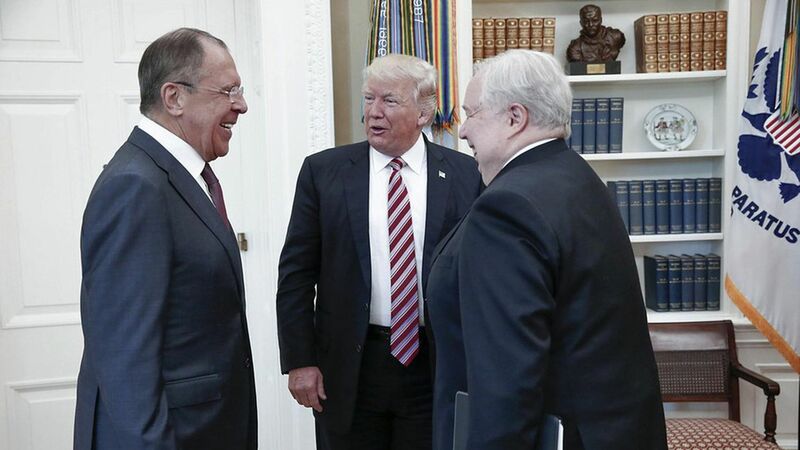 President Trump revealed highly classified information to Russian Foreign Secretary Sergey Lavrov and Ambassador Sergey Kislyak in an Oval Office meeting last week, according to a Washington Post report since confirmed by the New York Times, Buzzfeed News and CNN. What Trump reportedly said: After "boasting about his inside knowledge of the looming threat" he described a specific ISIS plot and the city where it was detected. The potential consequences: The intelligence-sharing system through which the U.S. learned of the plot is incredibly sensitive, and could now be at risk. What the administration says: National Security Advisor H.R. McMaster called the Post's report "false" but did not deny its key claims. Secretary of State Rex Tillerson issued a similarly incomplete denial. Complete coverage: timeline of WH response, the incomplete denials, GOP reaction, Dem reaction, and Trump on classified leaks. The Post pushes back: Greg Miller, one of the reporters who broke the story, accused the White House of "playing word games" in its denial, and National Editor Scott Wilson tweeted that McMaster "had the opportunity to call the story 'false' before we published it (we quoted him on the record.) He did not." Trump in the meeting, per an official: "I get great intel. I have people brief me on great intel every day." Another U.S. official to the Post: "Russia could identify our sources or techniques. I don't think that it would be that hard [for Russian spy services] to figure this out." An official to Buzzfeed: "It's far worse than what has already been reported." NYT: "A Middle Eastern ally that closely guards its own secrets provided the information, which was considered so sensitive that American officials did not share it widely within the United States government or pass it on to other allies." A White House adviser tells Politico: "He doesn't really know any boundaries. He doesn't think in those terms. He doesn't sometimes realize the implications of what he's saying. I don't think it was his intention in any way to share any classified information. He wouldn't want to do that." Per Lawfare Blog, "what Trump thought he was doing might well inflect whether we should see this as an act of carelessness, an act of carelessness bordering on treachery, or an act of judgment (even if misjudgment) of the sort we elect presidents to make." Republican Sen. Bob Corker: "The White House has got to do something soon to bring itself under control and in order….Obviously they're in a downward spiral right now and they've got to figure out a way to come to grips with all that's happening…. To compromise a source is something that you just don't do." Democratic Sen. Mark Warner: "A slap in the face to the intel community." NYT's Maggie Haberman: "Trump likes to show off his office toys. This is the intel equivalent of Trump showing ppl Shaq's shoe at Trump Tower." NYT's Glenn Thrush: "Reported fact-chain: 1) Comey requests more $ for Russia probe 2) Trump cans Comey 3) Trump invites Russians to Oval, divulges state secrets." Looking ahead: Trump departs Friday for his first foreign trip, beginning in the Middle East, and meets with Turkish President Erdogan Tuesday. Both events will put additional strains on a White House that is clearly in damage control mode.